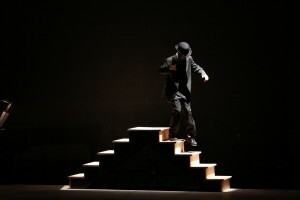 The piece debuted at the 2009 Tap Extravaganza in New York City in celebration of National Tap Dance Day (also Bill Robinson’s Birthday), and was a feature in CPD PLUS’s reconstruction repertoire which toured as Echoes In Time. Andrew is the first tap dancer to attempt the piece since his mentor Gregory Hines performed the stair dance in “Bojangles” the Showtime Biopic of the dancer by the same name. If your interested in having Andrew perform the Bill Robinson Stair Dance at your event contact Andrew directly for scheduling and rates.